Have climbed it in 1999 I think. But subsequently done reconnaissance for the approach. Wikimapia, Google Earth, Google Maps & MapMyIndia all have useful information. Typically there seem to be two routes adjacent to each other. Both start at 10 & 12 kms from Munnar Bus Stand on the Munnai-Udumalet road. The climb is 1000 m from the first point which is close to Nayamakad Bus Stop (1700 m). From here one crosses past the tea gardens and climb along a river coming down a slow climbing gorge, Once out of the jungle, turn left and climb towards the ridge over open meadows. Trail is clearly visible. Beware of wild elephants. Trail coming from the farther point joins just when the jungle opens up into meadows. 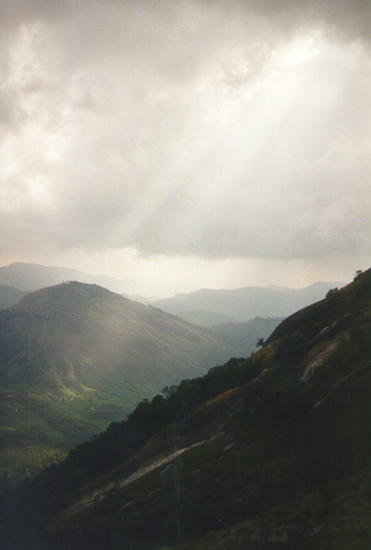 The point further down the road is higher by about 180 m and a further 2.4 kms away (12.4 kms from Munnar. This is at 1880 m above MSL. From here a marked trail (also see Google Maps) Valparai-Gundumalai trail climbs up to the ridge coming down from Anaimudi top seen to the left (South West). This is a 6.5 kms walk climbing about 675 m (1 in 10 gradient). The last one km is a 1 in 3 or 4 steep gradient. The ridge top is about 2550 m and from here the Anaimudi top (2695 m) is just 670 m (a comfortable 1 in 5 gradient). Use this relief map to navigate to mountain peaks in the area of Anamudi.